The building has began with the constructions of industrial bases, building sites, concrete-mixing plants, with the building of worker’s settlements, with the construct of highways and other communications, with preparing and preparation of water and energy supply units. There was withdrawn some hundred metres tunnel. The works are preserved temporarily. 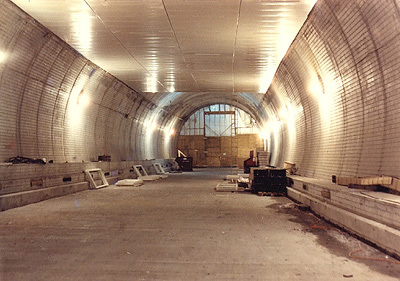 110m2 transversal sections and 510 longitudinal metres length auto tunnel, was built near the borough of Pasanauri (Chokheltkhevi) on Georgian military road. After famous earthquake in Armenia there was built auto road tunnel (The tunnel of Spitakh-Nalbakhdi with the length of 2100 m). From the projects realized by us one of the original is the underground bases building of two conjugated drinkable waters, in Tbilisi, which was made with the use of mountain relief, from which each of them is10 000 m3. In comparison with traditional open bases the thrift of construction stipulated the evacuation of town’s expensive territory and it become more expediently with ecological point of view. Society made the underground building, with open rule in Tbilisi, Vadja-Pshavela Ave.